Look around you: self-absorption; greed; frivolity; social anxiety; lack of empathy; exploitation; abuse. These are not marginal phenomena. These are the defining traits of the West and its denizens. The West's is a narcissistic civilization. It upholds narcissistic values and penalizes the alternative value-systems. From an early age, children are taught to avoid self-criticism, to deceive themselves regarding their capacities and achievements, to feel entitled, to exploit others. Litigiousness is the flip side of this inane sense of entitlement. The disintegration of the very fabric of society is its outcome. It is a culture of self-delusion. People adopt grandiose fantasies, often incommensurate with their real, dreary, lives. Consumerism is built on this common and communal lie of "I can do anything I want and possess everything I desire if I only apply myself to it". Women, for instance, concentrate on their body (as they do in eating disorders: Anorexia Nervosa and Bulimia Nervosa). They flaunt and exploit their physical charms, their sexuality, their socially and culturally determined 'femininity'. In its extreme form this is known as HPD or the Histrionic Personality Disorder. Many female narcissists secure their Narcissistic Supply through their more traditional gender roles: the home, children, suitable careers, their husbands ('the wife of...'), their feminine traits, their role in society, etc. It is no wonder than narcissists - both men and women - are chauvinistically conservative. They depend to such an extent on the opinions of people around them - that, with time, they are transformed into ultra-sensitive seismographs of public opinion, barometers of prevailing winds and guardians of conformity. Narcissists cannot afford to seriously alienate those who reflect to them their False Self. The very proper and on-going functioning of their Ego depends on the goodwill and the collaboration of their human environment. Even the self-destructive and self-defeating behaviours of narcissists conform to traditional masculine and feminine roles. 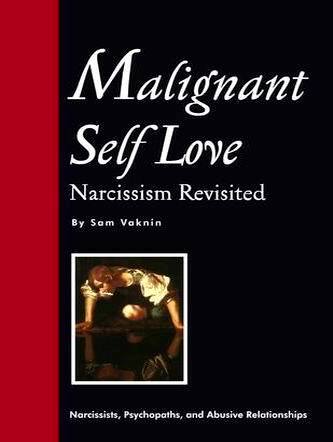 Besieged and consumed by pernicious guilt feelings - many a narcissist seek to be punished. The self-destructive narcissist plays the role of the 'bad guy' (or 'bad girl'). But even then it is within the traditional socially allocated roles. To ensure social opprobrium (read: attention, i.e., Narcissistic Supply), the narcissist cartoonishly exaggerates these roles. A woman is likely to label herself a 'whore' and a male narcissist to style himself a 'vicious, unrepentant criminal'. Yet, these again are traditional social roles. Men are likely to emphasise intellect, power, aggression, money, or social status. Women are likely to emphasise body, looks, charm, sexuality, feminine 'traits', homemaking, children and childrearing - even as they seek their masochistic punishment. "I Can Achieve and Do Anything If I Only Put My Mind to It"
From an early age we are taught (at least in the USA) that there is no limit to what we can achieve; that if we wish to accomplish something all we need to do is set ourselves goals and then apply ourselves to their attainment. With time and dedication, we are told, positive outcomes are guaranteed and ineluctable no matter how high we set the bar. There are no unrealistic aspirations - only insufficient perspiration and lacking inspiration! This is a narcissistic and delusional narrative. It is counterproductive because in reality we do have limitations, we suffer defeats, and we make mistakes. No one is infallible, invincible, omnipotent, or omniscient. But, exposed to this onslaught of propaganda, aimed at boosting our self-esteem and puffing up our self-confidence, when, inevitably, we fail in some of our endeavors - we tend to blame ourselves: "If only I had tried harder", or "I am such a loser, a lazy good-for-nothing, I never get it right!" Such inner sadistic voices tend to deplete our energy and discourage us from trying again. In hock to the official line that casts us as absolute masters of our own fate, we'd rather abstain than be proven wrong. By attributing failures to our failings, we become the reification of our own "bad fortune" or "indolence". We give up on life's challenges, engulfed by fatalism and defeatism. Some of us choose another path: "If I botched and bungled it, surely I didn't want it that badly" (a reaction known as "cognitive dissonance"). This kind of self-deception is equally self-destructive. It teaches us that nothing really matters, everything is fun and games and should not be taken too seriously. Reality and personal history are what you make of them and are subjects to re-writing, reframing, and outright confabulation. First, you should develop a realistic gauge of your fortes and weaknesses, talents and shortcomings, skills and limitations. Make a list of your own positive and negative traits. Ask others - family members, friends, co-workers, people who know you well - to commit to paper their observations: your good and bad sides. If they are reluctant to risk your ire find a way to allow them to submit their input anonymously. Now, compare the lists: the one that you have generated with the ones others have provided. Are they largely in agreement? If they are, it means that you know yourself well and that you evaluate your capabilities or lack thereof courageously and objectively. If, however, there is an abyss between the way you see yourself and the way others view you, something is wrong with your self-assessment. Concentrate on the questionnaires of those who know you best, longest, and in a variety of situations. Single out their responses which conflict with yours. Proceed to grade these answers on a scale of 1 to 5 with 5 being "I completely agree". Isolate those reactions and descriptions that you have rated most highly. Are you ready to change your mind about some issues? Do you recognize yourself in some of this feedback? Give yourself time to digest all this conflicting information. Think about it hard and long. Can you come up with incidents and events in the past which support your view - or theirs? Try to return to your list and re-do it in light of these new data. This protracted inner dialog is important. You are bound to emerge from it with a better, more functional appraisal of yourself. You will learn to set goals that are realistic are are unlikely to result in frustration and emotional pain. Getting acquainted with your limitations is the first step towards a balanced, mentally hale life. You and your nearest and dearest will benefit from it immensely.